Lehman Catholic’s Lindsey Magoteaux, left, and Botkins’ Madison Wendel chase after the ball during a Western Ohio Soccer League match on Tuesday in Botkins. The Cavaliers won 9-0. 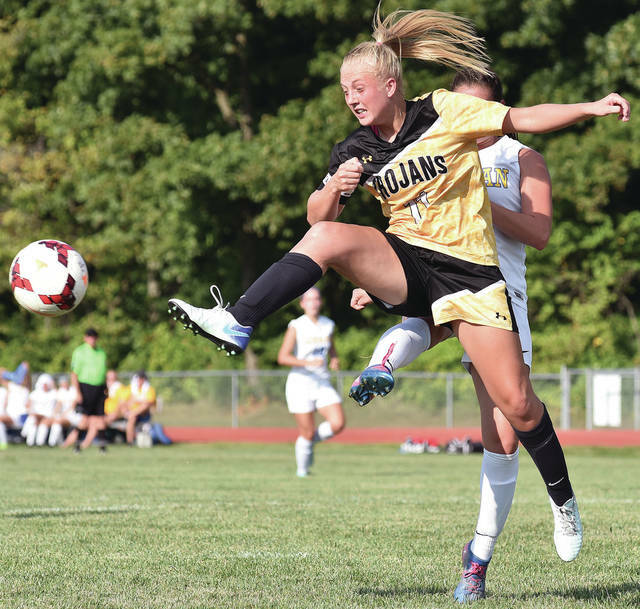 Botkins’ Taira Greve leaps at the ball in front of Lehman Catholic’s Samantha Edwards during a Western Ohio Soccer League match on Tuesday in Botkins. FORT LORAMIE — Jackson Center won the fifth set of a Shelby County Athletic League match on Tuesday 18-16 to earn a 3-2 win over Fort Loramie. The Tigers won the first set 25-17, but Fort Loramie won the second 25-23. Jackson Center then won the third 25-19 and the Redskins won the fourth 25-19. Raquel Kessler led the Tigers with 22 kills and had 11 digs and two blocks. Kate Sosby had 21 digs and Ashley Mullenhour had 39 assists. Izzy Hickey had nine kills and three blocks, Riley Jackson had eight kills, Sarah Clark had seven kills and Deja Wells had five kills. Marissa Meiring had 23 kills for Fort Loramie while Ava Sholtis had 11 and Chloe Stang had seven. Maya Maurer had 28 assists and Aleah Frilling had 16. Emily Austin had 25 digs. The Rockets won a home SCAL contest on Tuesday 25-13, 25-19 and 25-14. Emma Meyer led Anna with 12 kills while Madison Roe and Macy Wiktorowski had six each. Lexi Wells led the Rockets with 31 assists. Abby Counts and Wells each had eight digs, and Lauren Barhorst had three solo blocks. They could have been singing Billy Joel in Greenville on Tuesday, because the lights were out on Broadway. Or by Broadway, anyway. Greenville High School — which is one block off Broadway Street, one of the city’s major roads — had no power on Tuesday. As such, the school postponed a Greater Western Ohio Conference American North Division match against Sidney to a date to be determined. The Cardinals earned a 25-8, 25-9, 25-15 nonconference win on Tuesday. Taylor Paul and Josie Reinhart had seven kills each while Claire Pape and Macy Puthoff each had six. Rachel Kremer had five kills and five aces, Madison Pape had 20 assists and Blake Snider had 11 digs. The Rockets tied Northmont in a road nonconference match on Tuesday. Taylor Kauffmann scored Anna’s goal off an assist from Taylor Noll. Savanna Hostetler had 11 saves. The Cavaliers jumped out to a 6-0 lead by halftime in a Western Ohio Soccer League match on Tuesday in Botkins. Grace Olding, Rylie McIver and Ella Monnin had two assists each while Behr, Samantha Edwards and Allison Bornhorst had one each. Goalkeepers Hannah Giguere and Hiedi Toner combined on the shutout. Lehman’s JV game with Coldwater on Saturday has been moved up to a 1 p.m. start. Sidney lost a Greater Western Ohio Conference American League game on Tuesday at Fairborn. Trey Werntz scored both goals on assists from Josh Webster. 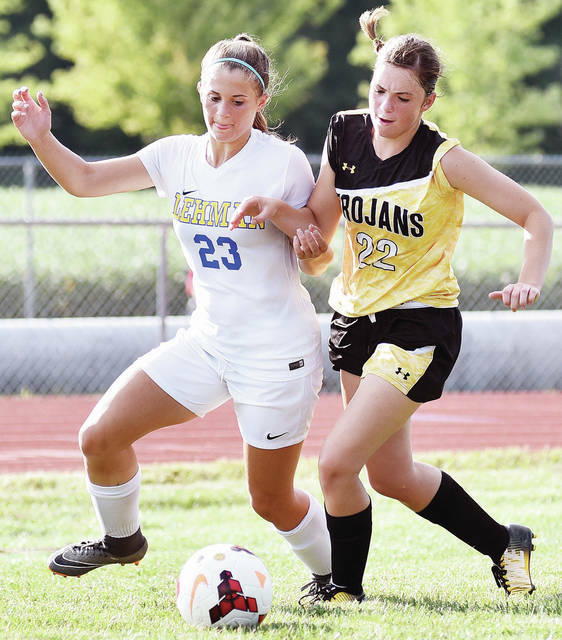 The Trojans strengthened their hold on first place in the Western Ohio Soccer League with a dominating win over Lehman on Tuesday in Sidney. Botkins outshot the Cavaliers 23-2 in the match. Nate Schneider scored two goals for Botkins while Zane Paul, Xavier Monnin, Zack Ware, Andrew Monnin and Brendon Thompson each scored one. The Rangers scored two goals in the second half to come back and tie Ottoville in a nonconference match on Tuesday. Zach Davis, Ryland Dyrness and Jose Maria Rabadan each scored a goal for New Knoxville. Joseph Baende had one assist and Josh Dietsch had five saves. The Yellow Jackets picked up a road GWOC American League win on Tuesday. Hailey New lost at first singles by two 6-2 scores. Kara Mays won 6-2, 6-0 at second singles and Mara Hecht won by two 6-0 scores at third singles. Sara Gibson and Jenna Allen won by two 6-0 scores at first doubles. Trotwood forfeited at second doubles. Lehman Catholic lost to Central Catholic on Tuesday in Lima. Claire Larger lost 6-0, 6-0 at first singles, Sarah Gibson lost 6-1, 6-3 at second singles and Angela Brunner lost 6-3, 6-1 at third singles. In doubles, Ann Pannapara and Keira Burns lost 6-1, 6-2 and Shannon Staley and Brieanna Werling lost 7-5, 2-6, 10-6. The Rockets picked up an SCAL win on Tuesday at Shelby Oaks Golf Club to force a three-way tie for first in the SCAL. Anna, Fort Loramie and Botkins each area tied for first. Bryce Cobb shot 39 for the Rockets. Cole Maurer had 40, Bryce Havenar had 41 and Spencer McClay had 44. Caeleb Meyer had 39 for Fort Loramie. Zach Pleiman had 41, Eli Rosengarten had 43 and Mitchell Puthoff had 45. The Tigers beat Botkins by four strokes in an SCAL match on Tuesday at Shelby Oaks. Trent Platfoot led Jackson Center with 41 while Christopher Elchert had 43, Jordan Rizzo had 46 and TJ Esser and Garrett Prenger each had 47. Nick Fischio led the Trojans with 38. Jameson Meyer had 45 and both Isaac Cisco and Jack Dietz had 49. The Pirates earned a Northwest Central Conference win on Tuesday at Cherokee Hills Golf Course. John Zumberger and Jayden Burchett each shot 47 for Riverside. Zane Rose had 52 and both Brody Rhoads and Jaxon Heath had 56.